"Faith is a legacy for many women in my family, as are the legacies of teen pregnancy, being single mothers, emotional and physical abuse, and poverty. We have all survived it because of the church and our powerful belief in God and prayer. I have been praising God since I was five years-old. I continue to thank and bless Him every day. I could have given up long ago. God has a hand upon my life. God has put me here for a reason. Maybe he has put me here to share what it means to recognize the gifts that God has given you and hold on to them with everything you have. Fantasia Barrino was only 19 when people all across the country voted her the new American Idol in May of 2004. Even judges Simon Cowell, Randy Jackson, and Paula Abdul agreed that she was their favorite winner ever on the popular TV show. As a proud single-mom, she became an instant role-model for girls without much hope who found themselves in a similar predicament. Soon thereafter, ’tasia, as her fans call her, recorded her first CD, Free Yourself, which went platinum in just a couple of months. Now she has written a tell-all autobiography, describing a life which has had more than its share of challenges. Besides having a baby out of wedlock at 17, she recounts a litany of woes she had to overcome growing up in the town of High Point, North Carolina. Although she had been warned by her grandmother not to get knocked up because, ’You will be on your own. No man will help you,’ Fantasia had to find out the hard way. She dropped out of high school unable to hold down a job because she was unable to read or make change. She went on welfare, but that money brought her ’baby-daddy’ around. And his M.O. was to beat her silly before taking all the infant's money, forcing ’tasia to shoplift for milk, diapers and other necessities. She bottomed out while sharing an apartment in the projects with another single-mom, drinking and smoking and frequenting nightclubs where she met more of the wrong types of guys. Obviously, her fortunes changed with American Idol, and she constantly credits her faith in God that she would find a way out of the ghetto. Since no co-author or ghost-writer is credited as having contributed to the memoir, Fantasia deserves the highest of accolades for having crafted such an honest, heartfelt, insightful and well-written book. Though now only 21 she shows evidence of having grown wise beyond the harsh teen years which threatened to take a great toll on her soul. Given its sincerity, its spirituality and its sobering message, Life Is Not a Fairy Tale is highly recommended for any at-risk teenagers with low self-esteem and in dire need of a reason for hope and of inspiration to keep the faith. For Fantasia makes a convincing case that if she could overcome all her obstacles, anybody else can, too. 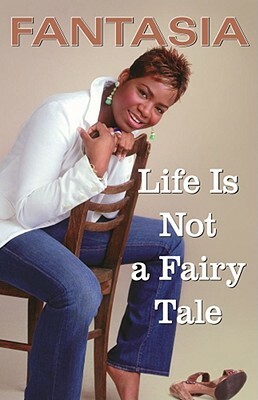 Read Touchstone’s description of Life Is Not a Fairy Tale.